It has begun! We started off with an easy section, the prologue, which is just a couple of pages long. Below are my thoughts on this section, some discussion questions for you to respond to, and a reminder about the next section & photo challenge. Today’s featured photos are by @thedarkestpartsofsnow & @book_inspired both very different styles but totally gorgeous! I loved seeing everyone’s photos, you made it VERY hard to choose just two, and it was great to see so many different editions! We have readers from all over the world, reading on every format – US, UK, paperback, hardcover, audiobook and ebook – this is a wonderful example of how diverse this global community is, and how we can all share our love of reading. Reading the first sentence was like stepping through a gateway. 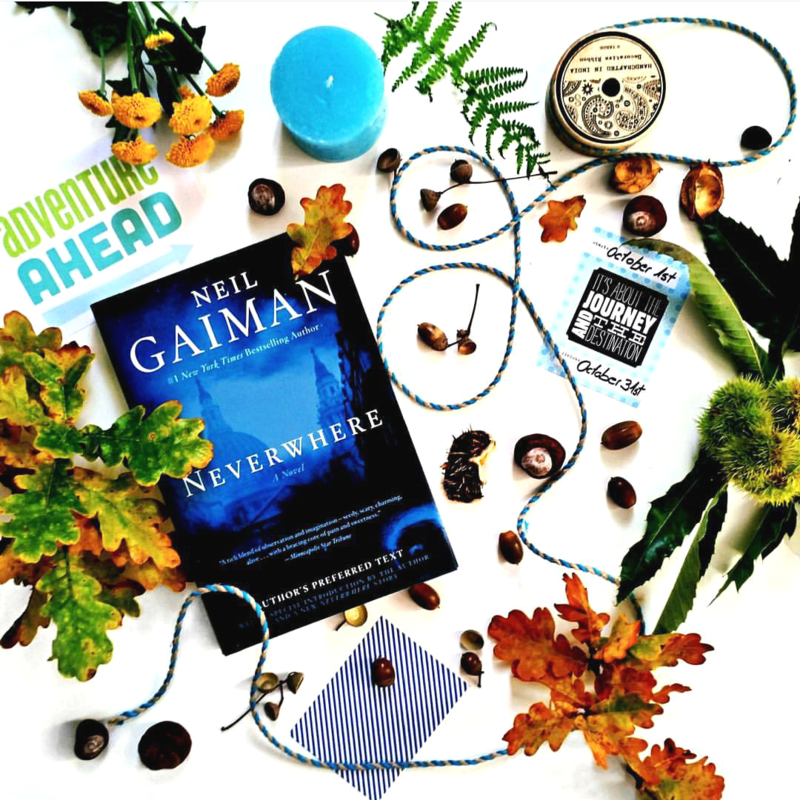 I was immediately drawn into Gaiman’s intriguing style, which keeps you playing catch-up with the characters from the very first word. I was also reminded of how little I remember of the plot – virtually nothing – so the excitement is rising to experience this in the same way as those of you who are reading it for the first time. It struck me that in 4 pages Gaiman was able to capture a strong sense of British-ness, highlighted beautifully by the sentence “Richard, you wanker, it’s your bloody party and you’re missing all the fun”, which in my head was shouted in a drunken slur by a voice that sounded exactly like a previous (English) boss of mine, and caused me great amusement. There might not be much content in the few pages that the prologue occupies, but there is a lot of foreshadowing of future events, so keep an eye out for them! 1. 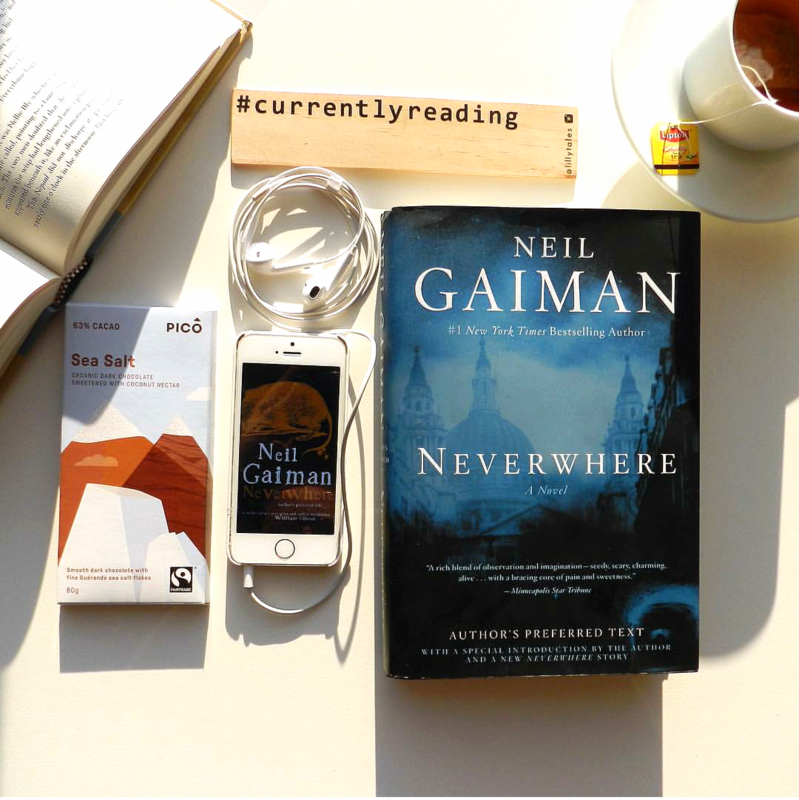 What are your first impressions of Neverwhere? 2. What was your favourite quote? 3. Richard says that he felt “the sense that he was leaving somewhere small and sensible that made sense for somewhere huge and old that didn’t”, have you ever felt similar to this- teetering on the edge of a big life change, looking forward with trepidation and back with nostalgia? Do you feel like Gaiman captured how Richard might be feeling well or did this miss the mark for you? *Note* I am reading the Author’s preferred edition (2015), some quotes may differ from previous UK and US editions. Feel free to discuss these differences in the comments, Gaiman himself has mentioned that the revised edition is essentially ‘the US edition with the jokes from the UK edition put back in’ to paraphrase, so I am really interested to see how the experience of reading the different editions differs. If you remember, try to note in your comment which edition you are reading. Photo Challenge: #mappedbooks – In the prologue Richard receives an umbrella with a map of the London underground on it. Maps are important throughout the novel for what they show or don’t show, and let’s be honest, a fantasy (or urban fanstasy like Neverwhere) isn’t complete without a map of some kind! I’m also starting to realise how little I remember – which makes this even more fun. Tamsien, you’re so right about the Britishness of it all; with just a few references (pints of ale, fifty pence piece, “me mam”, “wanker”, a thermos flask filled with tea) Gaiman paints a soggy, slightly dreary yet somehow charming picture of quirky Britain. I’ve spent my life moving around the world: Africa, the UK, Asia, Australia… So I can definitely relate to Richard’s mixed feelings about leaving what he knows for something new. It made me think that the feeling of being sick might not totally be down to the alcohol – because that’s how I always feel when I’m nervous about a change. Side note: I’m also reading the Author’s preferred text and I really enjoyed the glimpse into the writing process he offers in the Introduction: how the novel was born, how it evolved, his struggles to keep it as he wanted and his acceptance of changing it to improve it, and the considerations that go into writing for different audiences. I’d be interested to know if any Anericans are actually put off by the British humour. Any American readers with a British copy, please let me know! Oh great! We should definitely read that next. No, it’s not in my copy unfortunately – although I do have ‘An altogether different prologue’ with Vandemar and Croup, an interview with Neil and some reading group discussion questions which look good! Lara – the flask of tea on the train was such a nice English touch wasn’t it? So perfectly English! Next time you visit Corrina you are welcome to borrow my copy and read the intro. I’ve never actually watched the TV show, so perhaps we should find somewhere that we can buy/download it?! I think the ‘altogether different prologue’ is included at the back of my edition, so I’ll be keen to read it. I love how writing really is a ‘movable feast’ of changes. It is my very first time reading Neverwhere (Author’s preferred text edition) but the story hooked me right then and there. I feel that the way Gaiman sets the scene with darkness and rain, wind and an old strange woman (who of course is a kind of fortune-teller), he conveys the impression of foreboding of what the reader might expect in the chaperters to follow: strangeness, the uncanny, the inexplicable, gloom, suspense, mystery, excitement and maybe even dread. Richard arrives in London at “the strange Gothic spires and arches of St. Pancras station” and I immediately thought that this does not feel like modern-day London. Of course it must be, because there are tubes, but it seems like Gaiman puts the reader into a Gothic novel of the 19th century. Of course some of the motifs of the Gothic novel are strangeness, transissioning time periods (modern/ancient), dark and mysterious places etc. So I am really excited to find out whether my first impression of what we might expect will come true. My favorite quote was “You got a long way to go….” she said, puzzled. “London,” Richard told her. “Not just London” The old woman paused. “Not any London I know.” , because it stresses the first impression I got that this is not a modern-day London. Or rather, it is, but Richard will definitely get to know a different London, a mysterious and strange London. I thought Gaiman depicted Richard’s feelings perfectly. Richard feels a kind of dread but the same time we get a sense of anticipation. This again is a motif of the Gothic described in the notion of “terror” – which can be a good thing. An anticipated fear of sorts. It means that he is alert to the possibilities of things beyond his imagination, beyond anything he knows and that is ordinary. I hope I make sense :). Because I feel that Richard will find a different world, a world he did not expect at all. As I said before, the story drew me right in and once I posted this I will go on reading because I am really excited to find out where Richard’s journey might lead us! And finally: Thank you Tamsien for featuring my picture of Neverwhere, I feel really happy and proud! 🙂 Excited for the next challange and discussion. I love how wonderfully you have articulated the ‘same but different’ feeling that Gaiman evokes in the prologue. I had that feeling too, that the prologue is setting the scene so perfectly for what is to come. It will be really interesting to her your thoughts on other Gothic motifs throughout the book. I’m definitely not an expert (or even very well versed) when it come to Gothic literature (I’m a classic sci-fi gal) but I’d love to learn more and see how that shapes you reading of this novel. As to your photo, thanks for sharing it, it was gorgeous. And I did know it was you commenting 😛 Book_Inspired is actually my friend and colleague, she borrowed my copy of Neverwhere to take her photo. I hope I’m not biased in saying her photo is lovely, but I honestly could choose between you two for a feature. ou styles are so different but equally entrancing! Ah, I see! 🙂 Yesss, Book_Inspired’s photo was really lovely! I already shot my picture for the mapped books challange and I am excited to share it with everyone next week! Have a lovely Sunday! He’s Scottish! There’s nothing ‘perfectly English’ about it! I find the old woman and the ‘white underground umbrella’ like the White rabbit of Alice in Wonderland. The white rabbit was an indirect guide to Alice’s adventures, and the old woman kind of sheds a light on what Richard’s future has install (plus she now possesses a literal map of the ‘underground’ although not necessarily ‘London Below’. I reached a point in my life where I could sink no lower – so I literally packed a backpack with some jeans, socks and my passport and left Australia for the UK. I knew no one, had no idea where I was going. Literally bought a ticket and arrived in London with a two week plan (which was see London and give myself two weeks to find a job and that was where I would move to). It has changed my whole life! that one decision. I met my (future) husband in England 6 months into my trip – and 6.5 years later we are expecting our 3rd bub haha. So I could definitely relate to Gaiman’s illustration of Richard and the impending change of pace brought about by change of scenery. I had never thought of that White Rabbit parallel, but now that you point it out it is really intriguing. I remember so little of the plot that I’m not sure if it is something that continues through, but now I’m going to keep an eye out for it! Gaiman does tend to weave in influences of other things he has read and references stories and legends, so it may even be a deliberate addition! I love your Alice in Wonderland/White Rabbit parallel! Gaiman does say in his introduction that he loved Alice in Wonderland when he was younger and wanted this book to be a sort of ‘Wonderland’ for adults – so I think you’re probably right: it probably was influenced by Lewis Carrol (if not a direct reference). Regretting not buying an edition with an introduction more and more, this background knowledge is fascinating! This is my first time reading this book, and I am also reading Author’s preferred text. The story grabbed me and I’m already hooked!! In just four pages I’m ready to take the journey with Richard Mayhew! I love the quote “It starts with the doors.” It’s intriguing to imagine what it means, plus I have a love of old ornate doors, anything unique and different, so, like I said, I’m hooked!!! So glad you are enjoying it! It has really hooked me back in, and it was so hard to read just the prologue so I wouldn’t get mixed up and accidentally write something with a spoiler for you all! So glad to be able to read the first 5 chapters now over the weekend, and I can’t wait to share the excitement with you as you discover what all the references to doors are really about! Just based on the four pages of the prologue… I am beyond excited to read this novel. I am in love with Gaiman’s writing already. I was brought back to when I visited London (seriously jealous of any of you who live there), and could feel the rain and see the dark streets. My favorite line was “”You’ve a good heart, she told him. ‘Sometimes that’s enough to see you safe wherever you go.’ Then she shook her head. ‘But mostly, it’s not.’” It really hit me with its brutal honesty. There truly are so many good hearted people who suffer or encounter difficult obstacles in life, and this sentence immediately gives a sense of foreboding for our protagonist. For question three, I think I’ve had that feeling two times in my own life. 1. When I decided to study abroad in London knowing absolutely no one I was going with, and 2. When I decided spur of the moment to move to Connecticut right after my college graduation knowing only one person and having absolutely nothing planned or lined up. Both experiences started with butterflies of terror and excitement, and ended up being incredible life changing adventures. I think Gaiman did a wonderful job showing Richard’s nervous excitement while also capturing the idea that everyone Richard is leaving will continue on without him (which is a hard thing to accept). Your comment that “It really hit me with its brutal honesty. There truly are so many good hearted people who suffer or encounter difficult obstacles in life, and this sentence immediately gives a sense of foreboding for our protagonist.” really resonated with me. It is so true that this more than anything else in the 4 short pages makes me so nervous for Richard and his trip to London. It also makes me a little sad to think of how true this is, that kind hearted people are often faced with obstacles that make them suffer, where others may not. Looking forward to exploring this theme further, happy reading! My first impression of Richard is that he is going to be a bit of a hapless hero but that his heart is in the right place. Bit wide eyed and naive. Gaiman makes you feel sorry for him from the very start – no longer enjoying his leaving party, sat in the rain, vomiting in the gutter and then having to be up early for the six hour train ride while hungover! So I think Gaiman captured him and how he is feeling well. Really excited to read on! Very excited to share this reading with you, and can’t wait to see your reaction when the real significance of the doors are revealed. That is such a good point: I think an author usually needs to very quickly show you why you should care about the main character and keep reading. But this opening is interesting because there doesn’t seem to be anything remarkable about Richard at all. (Apart from maybe the unknowing sexiness of his bed head?!) We might feel sorry for him, but I’m not sure a drunk man in the rain is enticing enough on his own! I think Gaiman instead, very cleverly, uses subtle plot hints and foreshadowing to draw us in – with these questions rather than character adding intrigue. Although, the fact that Richard gives away his gift to an old lady in need does make him at least a likeable protagonist. What do you think? Absolutely. I think that’s the gift of Gaiman’s writing that so many overlook… He draws you in through unconventional writing. To be honest, my first thoughts on reading the prologue was an overwhelming urge to give Richard a hug, poor guy! The image of him sitting outside a pub as storm clouds gather and feeling sorry for himself while his mates celebrate his departure painted a very gloomy scene indeed, which is probably why the woman thought he was homeless and depressed haha! Instantly I was wanting to know more, and the forshadowing from the palm reading just sucked me right in. I have no doubt the remainder of the book will be just as engaging. As for question three: The only thing that comes to mind at the moment was first time leaving home when I moved away for University. I was 18 and moving across the state, knowing no one and possessing no life skills, including basic cooking skills (I’d only learnt how to cook pasty the day before). My parents helped me move all my junk, unpacked the car, gave me a hug and drove back home, leaving me standing in this tiny room with piles of boxes everywhere and me thinking “Oh god, can I actually do this?” Of course it’s a right of passage, but at the time I couldn’t think of anything more daunting or anything more symbolic of going from teenage years to responsible adult (although, really, whose an adult at 18?). My one experience that felt like that was the first time I travelled to Japan alone, walking through security alone, sitting at the gate alone, getting on the plane alone, and stepping out into the freezing cold Japanese night alone… All those things were exciting and terrifying, I wanted them so badly, but at the same time I was totally apprehensive about how the experience would unfold. In the end it was one of the most amazing experiences of my life, and I wouldn’t change it for anything in the world! I’m reading a library copy so I don’t have the edition many of you are reading. I have, however, put a reserve on How The Marquis Got His Coat Back, and I plan to get the DVD of Neverwhere when I finish reading. The prologue was wonderfully British! I adore British fiction, so this is an extra bonus for me as a reader! The dark and Gothic vibe is strong, but not overpowering. Just these few pages have me hooked on Richard and his story. My favorite quote (other than the one posted) is the first line: The night before he went to London, Richard Mayhew was not enjoying himself.” That sentence tells so much about where the character is in relation to his life events, and it shows the reality behind big changes: they may be for the better, but they are not always cause for celebration. There are so many emotions one has to face when dealing with such a change, and it is normal to feel the way Richard does. I’ve been in his shoes-facing a move away from everything/everyone I know, moving on to something new (and sometimes better), but still not feeling totally on board about it. Gaiman nailed this feeling, in my opinion. I could envision Richard out with his friends, yet seeming to have somewhat of a dark cloud hanging over him. I don’t think the alcohol was the only thing making him sick. Based solely on the prologue, I can’t wait to see what is in store for him. Thanks for joining us! I do hope you enjoy it, when I read books by Neil Gaiman I always imagine them read in his voice, so British… Though I have somehow only posted photos of one edition, based on the photos in the #babblingbookRA tag on instagram and some of the comments on the intro post before we started there are all sorts of editions (even some in languages other than English which is wonderful). Look forward to sharing this with you! I, too, read this with Gaiman’s voice running through my mind. I’m glad I’m not the only one!